I run a public Facebook group called “Proud to be a Second-Class Australian“. The aim of the group is to stimulate awareness of discrimination and to motivate people to campaign for LGBTIQ rights. I post a significant amount of content as part of my activism. Members can also post relevant content freely. I like to ensure what I post is “warts and all”, in an effort to eliminate bias. On August 10 I posted the aforementioned graphic to the Facebook group, including a link to the Crikey article. 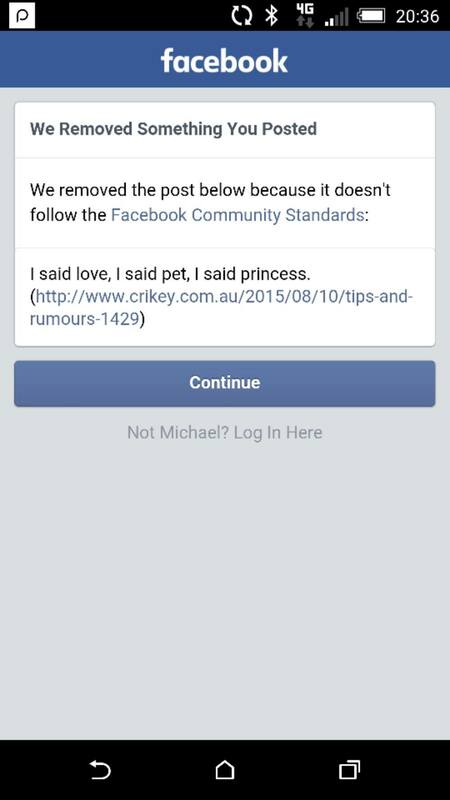 I captioned the image “I said love, I said pet, I said princess.” Shortly after posting the image I received a message from Carl Katter and then he blocked me. Fair enough. He’s entitled to do this. He did this a couple of years ago too. Some time in the middle he unblocked me. I guess at that point he felt he wanted me back as a Facebook friend. It’s been a frustrating week for me as this ban has severely limited my capacity to do my activism. It’s been the busiest news week in 11 years on marriage equality. It’s been the week in which I was the key player in breaking a story on a controversial reparative (“gay cure”) therapist coming to talk to a Melbourne Jewish child sexual abuse group. It’s been the week one the biggest marriage equality rallies ever happened in Melbourne. It’s been the week Carl Katter probably needed some good publicity in his election campaign. It’s also been another week I’ve not needed more unnecessary distractions in my personal life. 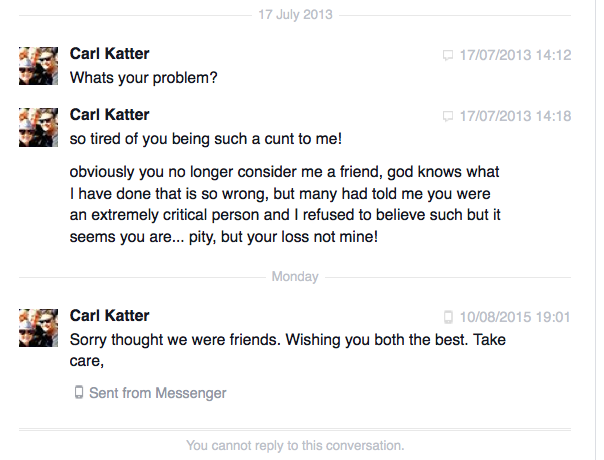 So I ask the question why Carl Katter would not want me to post a picture that is already in the public domain, about comments he posted on Twitter two years ago. Why would he block me on Facebook for doing this? Why would someone concerned about Carl Katter’s reputation report a photo of a public Twitter conversation including him to Facebook that resulted in me copping a harsh 7-day posting ban? I get no say in this outcome on Facebook. I just have to cop it sweet. I’ve mostly managed to work around it but it’s wasted my time and significantly diminished my capacity to fight for LGBTIQ equality during a particularly important week. If Carl Katter is concerned about his image and if he wants to maximise his chances of winning the seat of Higgins, it certainly doesn’t bode well for him to piss off gay rights activists. Why am I so harsh on him? He’s abused me. He’s abused my husband Gregory. He’s abused other people in the LGBTIQ community. If he is going to stand for public office he needs to stop abusing people. Actually, he needs to stop abusing people irrespective of whether he is standing for public office. But he is not going to get away with abusing people when he stands for public office. Carl Katter needs to be accountable for his words. Carl Katter, meet Barbra Streisand. You are currently browsing the mikeybear blog archives for Aug, 2015.